Guys! I am so happy to tell you, BERN has been thrown into the spotlight across all the pro-bernie facebook groups!!! This comic was made by https://www.facebook.com/TheBankey/ Please like and share the page and Adam's posts about BERN. Thank you for doing so. Like I said, this was spread across all fb bernie groups. If Bernie was not aware of BERN, I think it is a safe bet he or his advisors are now. No "cease and desist" orders received, lol. Only kidding, I am certain Bernie would have no problems with the BERN project. In fact, I think he would be proud to learn his is the only presidential political coin that has not been proven to be a scam, like clint and trump. Honestly, I am very proud to see @SaxtonSteven besides @SenSanders in the tweet! As well as seeing the fb post which was dedicated to me and mentioned my tagged name in all the Bernie groups. I commented a link to the website in all the ones I could find so if the comic sparked someone's interest, they could learn more and perhaps download a wallet and become involved. This is some good free marketing for BERN. I am very happy about it. Be sure the fb posts gets some lovin' too everyone! This is not exactly, "thrown in the spotlight" as much as the cartoon was but, it did get a little exposure and free publicity on one of the Bernie meme groups of FB. A Bernie supporter was offering to make memes for people and I asked her to dress this picture you probably are familiar with up a little. 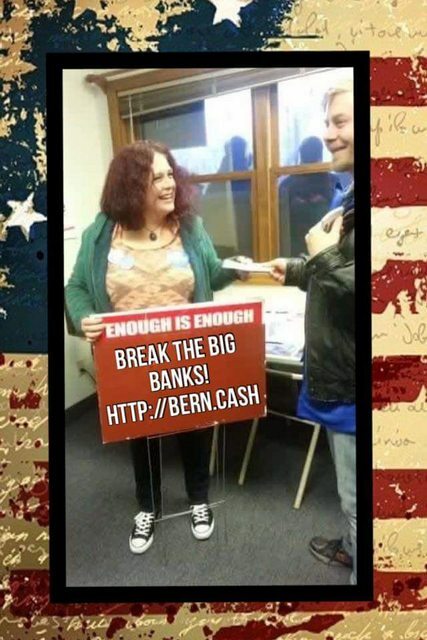 It is a picture of me distributing BERN paper wallet airdrops at a local BERN center grand opening. She kindly did so. 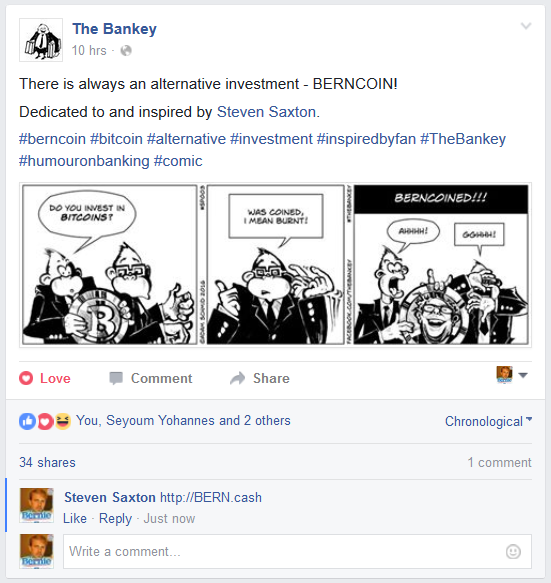 The BERNcash name got in front of many people, I imagine it sparked the curiosity of some of them. It is no secret BERN does not have the financial resources some other projects may have. Free publicity is always welcome.